If you like lots of glowing green pitchers on your plant, this is the one for you! This hybrid is the result of a multi-generational cross between a Sarracenia flava (Yellow Pitcher Plant) from North Carolina, a S. purpurea subspecies purpurea (Northern Purple Pitcher Plant), and a Sarracenia rosea (southern species that used to be considered a Purple Pitcher Plant). 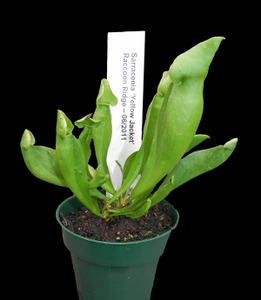 This particular plant, though, is known for its hybrid vigor, readily producing multiple offshoots of glowing green pitchers that most closely resemble the extremely rare all-green variant of Sarracenia rosea...all in a VERY easy-to-grow hybrid. Medium plants in 4-inch pots, ready to grow. A wonderfully easy plant, so get them now, while we have them in stock!